No clue why we decided to go out for lunch today, but boy, am I glad we did. Since moving to Kalamazoo a year and a half ago, I’ve been on the lookout for that burger that I just had to have. I’ve found some good ones, but very few craveable ones. If you’ve learned anything about J and I, you should also know that we like bar food. I would much rather go to a good dive bar with great food than a fancy place with tiny plates. 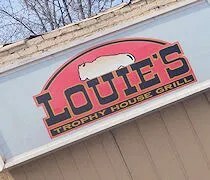 I don’t know how, exactly, I first learned of Louie’s Trophy House Grill on North Street near downtown Kalamazoo, but I’ve always had a hard time finding info. Sure, they have a website, but they don’t have a menu on that website, so I kind of blew it off. Just recently, I was searching for places that we haven’t been yet and I came back to Louie’s. Still no menu on the website, but I found a bunch of great reviews on places like Google, Yelp, and Urbanspoon. I guess that means it’s time to give it a try. I had absolutely no idea where 440 E. North Street was. Even after I looked at a map, I couldn’t picture it. I headed towards downtown Kalamazoo then turned north on to Park Street. I took a right at the Park Street Market which is North Street and headed east until we found. The pub is in a somewhat industrialized area and it’s a very plain looking building with very few windows. It really looks like a brown box with a front door. Parking was a little bit tight because they had tents set up in the parking lot. We pulled into what would usually be a pretty large lot, but there were no spaces we could access, so I headed back out to the street and just parked there. 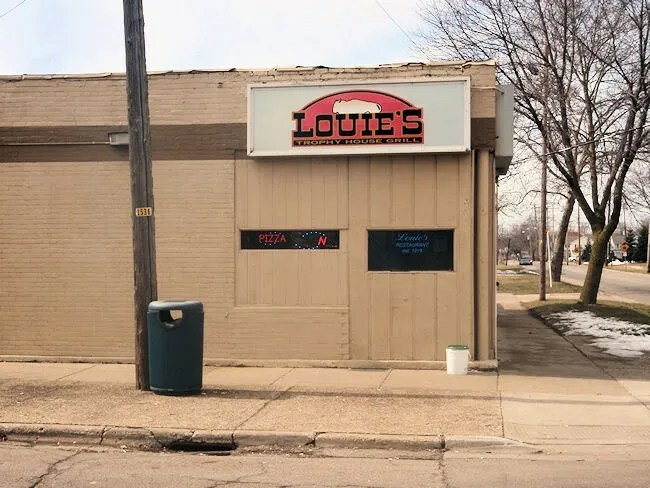 Louie’s claim to fame is being the oldest bar in Kalamazoo. They opened in 1918 and have went through the depression as a speakeasy, became a fine dining restaurant, and now serves as a neighborhood bar and live music venue. As you would expect from a place that’s been open for almost a hundred years, much of the decor is dated, but if it was new, it wouldn’t have the charm that it does. The pub is set up with a large bar in the middle. There is a row of booths along one wall. The short wall has a couple circular booths for large groups and the other side of the bar has a handful of tables. The wood paneled walls are covered with pictures and taxidermied animals. All of the booths were full when we walked in so we decided to take up one of the big booths. The bartender/waiter came over with a couple menus then went to get us a couple Pepsi’s while we looked it over. My eyes went straight to the burger section like it always does, but they have a delicious looking new pizza menu. I was really close to going with the pizza, but I read too many good things about the burger. The pizza will have to wait until the next trip. The burger I went with was the Black & Bleu Burger. All the hamburgers are fresh pattied meat from V &V Meats. The burger came out char-grilled, but perfectly pink in the middle and very juicy. 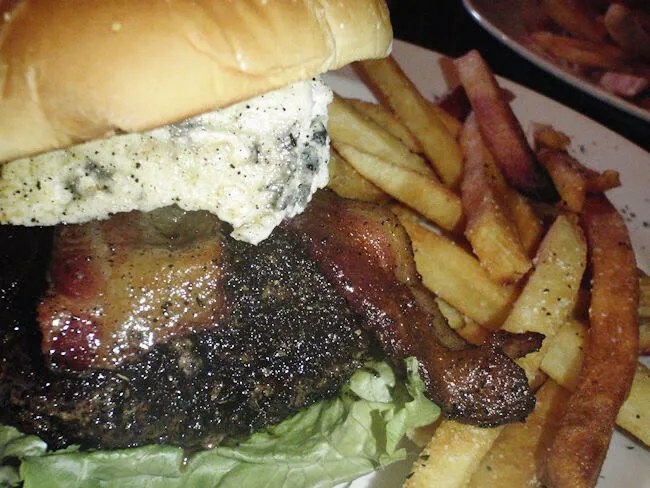 It was served with two slices of bacon and the largest piece of bleu cheese I have ever seen on a burger. The bread is a bun from Mackenzie’s Bakery. This burger is definitely one of the best, if not the best, burger in Kalamazoo. The meat had a wonderful smokey, charcoal flavor yet it was far from being overdone. It was very juicy and the large wedge of bleu cheese made this sandwich craveable. The sandwich comes with chips, but I went ahead and did the upgrade to fries for an extra buck. Just like the sandwich, these fries were above average bar fries. Very crispy, just a little greasy, and very tasty. J stuck to her usual as well and ordered the Buffalo Bleu Cheese Chicken. 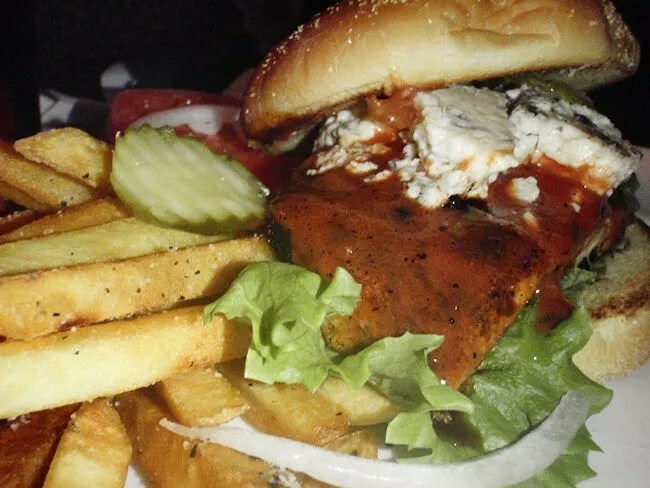 That sandwich is grilled chicken tossed in a Buffalo sauce then topped with bleu cheese, lettuce, tomato and pickle. Her first bite got the same reaction as my first bite did. How have we never eaten here? She said the chicken had a great smokey flavor and the hot sauce, that would have been too hot on it’s own, was tamed by the most bleu cheese she has ever had on a sandwich. J was very pleased with her sandwich and already talking about how we need to make Louie’s a regular stop. Her sandwich also came with chips, but she upgraded to fries as well. Our bill was a little over $20 which was given to us on two separate checks. I handed both checks back with my credit card and told him to just put them together. I feel stupid that I never gave Louie’s a try before. I found it not long after we moved here, but the lack of a menu and no knowledge of where this place actually was scared me away. Louie’s is easily one of the best bar food places in Kalamazoo. If you haven’t figured out where this hidden gem is yet, find it! Thanks for all of the compliments towards my workplace. Makes me feel good to work there.